The mainstream media covered the interview unfavorably, noting that the radio host has spread fake news in the past. They’ve also, of course, accused King of racism thanks to his support for Western civilization, and made every effort to paint him as a Nazi. In this case the link is a bit closer than usual. Unzensuriert is associated with an Austrian political party, with which King also took meetings, that was founded by an actual Nazi officer, and its current leader was in a neo-Nazi group when he was young. Still, the argument for King personally being a Nazi is more in the media’s imagination than in any actual evidence. King’s concern that Western civilization’s excellent contributions—as embodied in rationalism, empiricism, republicanism, constitutional government, and the Judeo-Christian religious heritage—may be substantively altered or damaged by mass migration from countries with different value systems is perfectly rational. Not all cultures value the same things, most immigrants do not completely assimilate to a local culture, and individuals have a legitimate interest in preserving their culture and way of life, even beyond their own lifespan. Indeed, the whole power of the wave of populism that has nearly destroyed the center-left in Europe and the United States is driven by voters who believe, not that people of a different race are somehow inferior, but that they are supporting a project that is bigger than themselves: the defense of the West. Europeans are right to have concerns. The combination of pressure from eastern authoritarianism in the form of revanchist Russian aggression and a booming African population that will likely lead to a century of migration are demands such as Europe has not faced for 2,000 years. They are creating a political pressure-cooker. It is hard to see how Europe can withstand the dual onslaught of Africa and Asia. This is especially true given that many of Europe’s republics are institutionally young and untested in crisis: we simply do not know how Lithuanian democracy will perform in a durable crisis, or how Croatian institutions will hold up to massive demographic change. They are to some extent untested. Further, above these nascent republics is a wobbly federation: the European Union. Both too interventionist and too weak to govern, the E.U. is also an untested institution with untried and ambiguous mechanisms for serious conflict resolution. On its face, then, King’s concerns seem rational. Europe is under threat. But alas, the solutions to Europe’s problems aren’t the combination of walled-off national borders and Euroskeptic politics that Europe’s populists prefer. Preventing immigration into Europe completely will lead to a speedy demographic decline and even worse power balance for Europe: a shrinking Europe will be less, not more, able to assert itself. Even more to the point, if Europe’s republics go it alone on issues of migration, borders, and security, they will fall one by one, like the Gothic fiefdoms of Spain of old did to the Moors. Only a robust Europe engaged in a collective project of border control, migration management, and regional security can plausibly assert its interests in the face of an aggressive Russian threat and a continent to its south that will soon have more than three times the population of Europe. In other words, the civilizational threat to Europe is real, but the populist parties of Europe aren’t offering a real solution. The way things are currently going, it seems inevitable that much of Eastern Europe will be re-absorbed into Russia by the end of this century and much of the rest of Europe will be culturally unrecognizable: and populist movements are doing nothing to change that. What isn’t clear, though, is why King spends so much of his time on Europe’s problems instead of Iowa’s. King tweets in support of Dutch populist politicians, retweets British neo-Nazis, endorses French populists who will save our “shared civilization,” tweets his support for Hungarian populists for defending Western civilization from George Soros, and has time for populist radio shows in Austria. But while King is pal-ing around with his populist friends in Europe, his poll numbers in Iowa are tanking. He won his last election in 2016 with a 22 percentage-point margin. But the most recent polls of his district show that his current race is a dead heat. He might lose. The mainstream media would have you believe that King’s problem is “white supremacy,” as if his policy views suddenly changed since 2016. But his district didn’t suddenly turn against his conservative beliefs, and his policy positions didn’t change. Rather, what changed from 2016 to today is King’s obsession with European politics. He’s shifted away from being just an American politician to being a member of the global populist consortium. What Steve Bannon is doing is creating an international network of populists—or, to put it in plainer terms: a global alliance of populists. King may not be endorsing that exact idea, but it’s clear he’s calling for tighter linkage between right-wing parties around the world, based on their common identity as right-wing parties. The issue here is that King sincerely believes that the West, collectively, in some cosmopolitan sense in which we are all citizens of the west, faces a civilizational challenge. That is, he sees the American and European experiences as fused together, facing identical, homogenous threats from third world mass migration. This comment is hardly damning on its own: virtually all orthodox Christians would proudly confess a kinship with Christians around the world, the “church catholic,” or “invisible church,” or simply the brotherhood of all believers. But King wasn’t being asked a theological question; he was being asked about the political foundations of nationalism, and he responded by contrasting his worldview-based loyalties to leftists in America. Again, it’s fine to feel kinship with Christians around the world: but that kinship is a matter for the kingdom of God, not the kingdom of man. What King is really saying here is that he feels more national identification with a Syrian or Iraqi Christian or an Austrian right-wing radio host than with an American leftist. In responding to a question about national identity as he did, what King is really saying here is that he feels more national identification with a Syrian or Iraqi Christian or an Austrian right-wing radio host than with an American leftist. It would have been fine to express those sympathies if he’d been asked about who he’d rather spend a weekend with, but that’s not what he was asked: he was asked about the basis of national kinship and sympathy. He goes on to describe Jan Sobieski, a Polish national hero, as a “common hero” shared by Americans. How many Americans have ever even heard of Sobieski? Exactly how much does he think Americans care about the siege of Vienna? The only way Sobieski is a “common hero” is if your definition of the common identity is not based on actual nationality. After being criticized for his interview with Unzensuriert, King responded that the people he was meeting with “would be Republicans” if they were in America. Whether he’s right or wrong, the comment was, again, unintentionally revealing how he thinks about politics: King thinks about his global tribe first and his national identity second. His priority is not primarily defending his co-nationals, or his constituents, from criticism by foreigners, but of creating political kinship with foreigners, aligned against his co-nationals. This is exactly what many people accuse progressives of doing! But here’s King revealing that his mental heuristic for who to associate with is first and foremost partisan and secondarily national. This distinction has big real-world consequences. For example, if you see the American and European experiences as united, then you might rightly worry about a massive wave of culturally foreign immigrants. Europe may be a leaky ship in a storm, but America is an aircraft carrier. Europe truly is receiving such a wave, and it may create very real challenges for European governments. But there is no such wave in America. Immigration into America is actually below the historic average right now! To the extent we do get immigrants, they’re mostly Christians from Latin America, or university students from China and India: hardly existential threats to our way of life. If you see the American and European experiences as a single “Western” experience, then you might be concerned about fragile institutions: many European democracies are young and untested, the E.U. is a quasi-federal apparatus that has arguably failed its first serious tests, and Europe remains a deeply divided continent. In America, while we certainly have problems and divisions, our constitutional, federal system still appropriately balances power across states and people, providing a robust dispute-resolution system that has weathered far more serious difficulties than we currently face. Europe may be a leaky ship in a storm, but America is an aircraft carrier. It won’t be sinking any time soon. Sure, we might need to make some reforms, but overall, our system works. Europe has been experiencing anemic economic growth and basically zero real recovery from the recession of several years ago. America has been enjoying one of the longest economic expansions on record. We just aren’t facing the same difficulties as Europe. In other words, when Americans make political choices based on the European experience, they are making choices based on incorrect information. The American system, for all the bumps in the road, is basically working! Immigration is at moderate levels, illegal immigration is near the lowest level in decades, and immigrants are learning English and getting jobs at about the same rate as they always have. While there are real issues to deal with, like the rising tide of authoritarianism on the left, we simply have no civilizational threat like Europe has. Even on big issues like China, China’s population will soon slip into a steep decline, rebalancing the scales between us. Our long-term civilizational future remains bright in America. But in the pursuit of his misguided and pointless quest for an anti-Soros international populist consortium, King is disappointing his constituents, hence why he is polling more than 20 points below the vote total in his last election. Furthermore, because King isn’t on any defense or foreign affairs committees, his foreign trips aren’t even doing anything to advance American diplomatic interests: he’s just embarrassing the country while abroad. And he is, truly, embarrassing us: his recent trip was paid for by a Holocaust remembrance group. He used the plane ticket they paid for as an excuse for private travel to Austria to meet with populists. He met part of the Freedom Party, which was founded by a Nazi SS officer in 1956 to oppose socialism and Catholicism, and advance “pan-Germanism.” That historic baggage aside, the current leader to the FPO was arrested in 1989 for participating in a torchlight parade organized by an illegal underground neo-Nazi youth organization. The current FPO doesn’t advocate anti-Semitism, and King’s meeting doesn’t in any way mean that he is okay with FPO’s Nazi heritage. But it was incredibly, embarrassingly foolish and deeply disrespectful to take meetings with such a group when one’s airfares are being paid by a Holocaust remembrance group. King’s exuberance for international right-wing fraternity led him into an obviously inappropriate set of meetings. King’s exuberance for international right-wing fraternity led him into an obviously inappropriate set of meetings. Then, while visiting Holocaust-related sites in Poland, King started “just asking questions” about whether the Nazis were really worse than the Soviets. I’m not kidding; he really, while visiting Holocaust sites, tried get his Polish hosts to tell him that the Soviets were really the worse overlords! King explicitly told news outlets he did this. While there may be an interesting academic discussion about the relative evils of Communism and Nazism, and the death toll of communism may actually be higher globally, an Auschwitz tour paid for by Holocaust survivors is not the time for that discussion! Any decent person can recognize this. For King to independently mention he had such a shameful exchange suggests he’s either painfully ignorant of basic diplomatic norms, in which case probably international politics isn’t the life for him, or he’s so devoted to signaling his allegiance with the global right-wing that he’ll internationally embarrass himself to be part of the club. His embarrassing conduct goes back further, of course. King is an Iowan, and his ancestors appear to have been almost exclusively northerners or immigrants. Yet he used to keep a Confederate flag on his desk. He advances a damaging, globalist ideology that is contrary to American ideals of civic nationalism and embarrasses his country and his constituents. I don’t begrudge southerners flying the flag their ancestors fought under: history and heritage are complicated things. I won’t dishonor the graves of my ancestors who fought for the South, even as I loathe and detest slavery. But King’s ancestors didn’t fight for the south! He has no tie to the South whatsoever. He’s a Yankee, betraying the memory of his ancestors who fought for union, so he can fly the flag of secession: because, again, King is not a nationalist! He doesn’t support distinctively American nationalism. He supports something else entirely. King kept displaying the flag despite criticism from Iowans until a gunman waving a Confederate flag shot and killed some police officers in Iowa. Then he took the flag down, facing insurmountable public pressure. 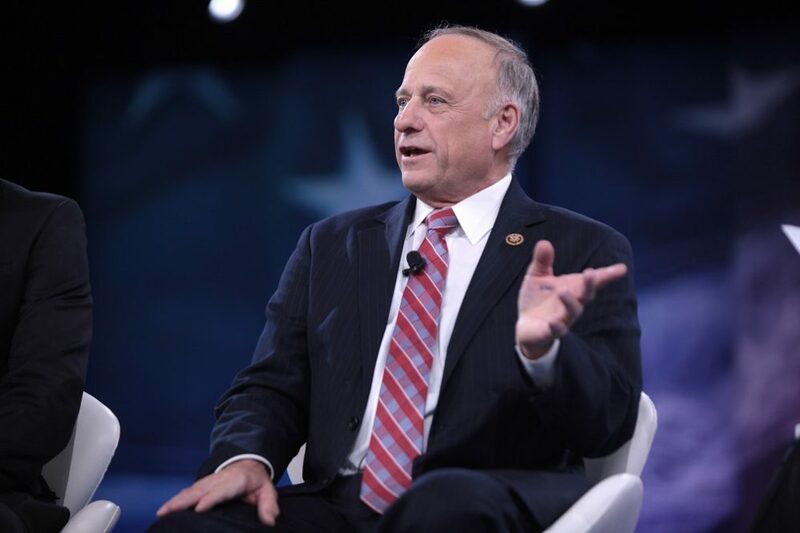 Again, his conduct is an embarrassment to Iowans, and its only plausible explanation is that King doesn’t care: he just wants the project of global rightism to succeed, whatever the personal costs. King may lose his election. Frankly, he should lose it: he advances a damaging, globalist ideology that is contrary to American ideals of civic nationalism and embarrasses his country and his constituents. He’s already lost the endorsement of major local employers, and he’s increasingly losing the support of his fellow Iowa Republicans. While most conservatives understandably can’t stomach voting for King’s pro-choice opponent (I certainly couldn’t), they’d be better off abstaining than voting for King. If King loses, then good riddance. The party, and the country, are better off without him in office.